This evening we went to watch the Penguin Parade on Phillip Island. It was massively crowded. There must have been a couple thousand people there. It was fairly expensive, more than $30 for Antonia and myself. They were selling coffee, tea, and popcorn as if this was a huge media blitz. I was expecting millions of penguins to storm the beach! We arrived at about 9pm, headed to the beach with the droves of others and tried to get a glimpse of the beach through the crowd. They have stadium bleachers set up. After about 9:30pm a large majority of the people wandered off. I never saw millions of penguins. The ranger told us on an average night, they see maybe 600-900. I think we spotted 3 groups with between 7-10 penguins and maybe 20-30 in groups 1-3. 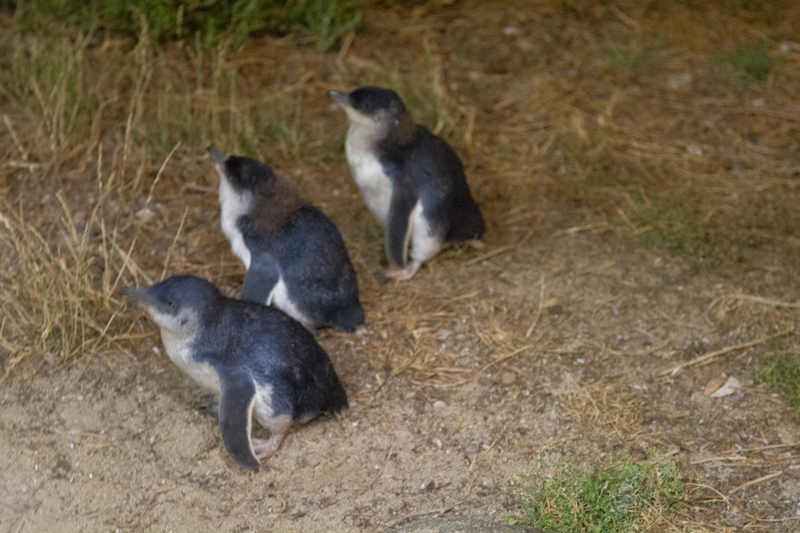 We wandered back up to the visitor center where you watch the penguins waddle their way up to their burrows. Pretty interesting watching them arrive and greet their mates and coo. We had a good time though I think this tourist event is way overly hyped. Photos are strictly prohibited outside of the visitors center. I snapped this photo through the window of the visitor center where it was allowed without a flash. It was taken in near total darkness, manually focused, 6400iso and an exposure of about 1.5 seconds. Out of 20 or so shots like this, this was pretty much the only one that came out and even then it's quite blurry and grainy if you look at the larger image.